I really like the pizza we make at home. We get to choose exactly the toppings we want, and we know what goes into the dough. But the truth of the matter is, we have neither an oven that gets up to 800 degrees nor a 30-foot peel for sliding pizzas in and out of such an oven. New Haven, CT's Wooster St. has at least three such pairs. So, naturally, we rented a ZipCar and headed for New Haven. Ostensibly we were going to see my friend Aaron, but there was mutual acknowledgment that this short trip was about one thing and one thing only: pizza. 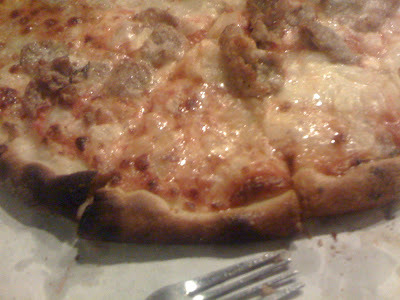 Our experience with Wooster St. pizza ended up roughly par for the course. We drove past Sally's, which had a line of about 3 people out the door (which I declared to be interminable) and pulled over at Pepe's, a few blocks down. The line outside of Pepe's was suspiciously short for a Friday night, and it turned out that Pepe's itself was closed (just to emphasize: it was closed, but there was still a short line). However, Pepe's has a backup location behind its parking lot, "The Spot," whose pizza is identical. Mia and I stood in line outside Sally's in the pouring rain for about 15 minutes, watching the line grow in front of us as a few families cut to the front (they must have had the infamous "secret number" for reservations). The Sally's line shortens only by attrition; no one without a reservation ever seems to get a seat. So we doubled back to The Spot and met Aaron, who was saving us a spot in line there. The quality of the pizza was evident through the window, through which we could see Connecticutians biting down on every variety of irregularly shaped piece of pizza. We sat down and ordered two red pies with mozz. - sausage and onion, and vege (without the green peppers). Naturally, the sausage and onion was for me. If you're ever in New Haven, it is imperative that you head to Wooster St. Pepe's is open for lunch, but the traditional time to go is Sunday in the late afternoon. Show up 20 minutes before opening and you'll be sure to be in the first wave of customers. You won't be disappointed. 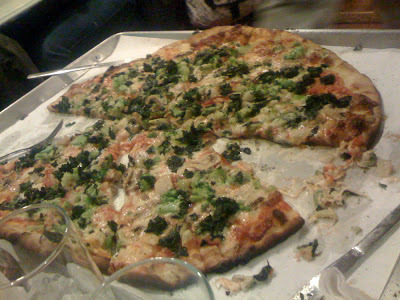 you know.... i was in new haven for four years and never made it to any of the big pizza places! wasn't as much of a foodie back then and now i regret not going to those places! 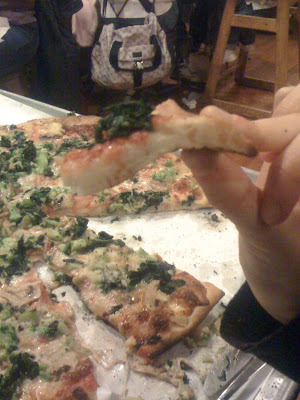 You should try Di Fara's in Brooklyn NY on avenue J (another zipcar jaunt). So good you will weep.